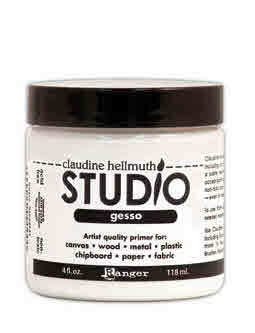 Use Claudine Hellmuth Studio Gesso to prime any surface for painting. A base coat with a slight texture, it is ideal for priming canvas, wood, metal, plastic, chipboard, paper and fabric prior to painting. Use with Claudine Hellmuth Studio Paints or other paints. Use to prime Studio Sticky Back Canvas.